As of 2019, Ooredoo leads the Tunisian mobile sector. The operator has a broad GSM coverage, on the same level with Tunisie Telecom, its main competitor. Ooredoo's market share is 43%. 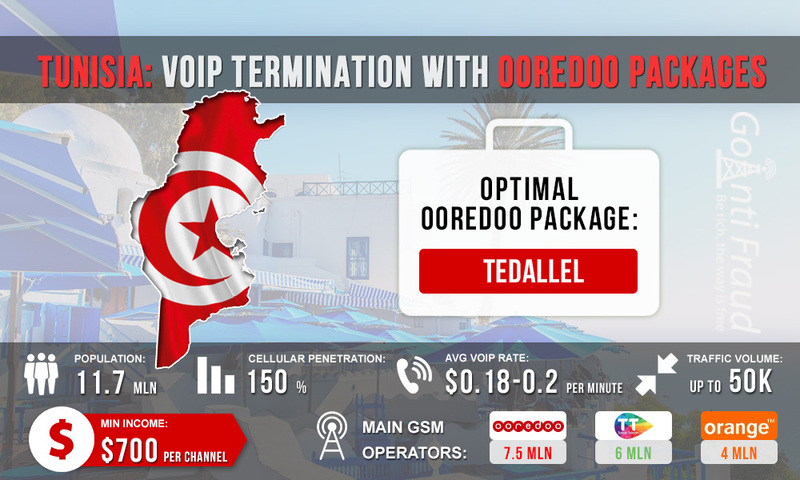 Ooredoo’s prepaid starting plans will be a good solution for VoIP traffic termination, provided the best tariff plan is selected for work. Offre Tedallel. The cost of a call per minute is $0.01 (to any network). Offre 1000. It provides for a 1000% bonus for topping-up. A minute of a call costs $0.13, but thanks to the bonus, the calls will cost you much less. Nessma Mobile. Provides for a bonus for calls - 10 hours to all networks. Kima T7 eb. 120 minutes to make calls for $1.65. Offre Tedallel is a great choice for earning on the termination. With this plan, a minute of a call costs only 1 cent, which is very cheap, especially with an average rate of $0.18. With the gateway with voip software sip running for 5 hours a day, you will earn at least $900 from each equipment channel. To minimize your expenses and maximize your earnings, use GoAntiFraud software to bypass the antifraud systems. In countries with high average rates, termination tracking systems are actively working, since the more expensive the international mobile communication is, the greater is the profit of the operator who would not want to lose it. Reducing the frequency of the SIM-block will allow you spending less on buying new SIM cards and therefore you will earn more.